In short: A luxurious, safe and functional seven-passenger SUV. When we first heard that the Mercedes-Benz plant in Tuscaloosa, Ala., was going to produce yet another "truck" we wondered why, especially when it’s a big one. Thankfully, the new GL450 overcomes its size and is nearly as easy to drive as an E-Class sedan. The GL-Class is not a replacement for the popular box-on-wheels G-Class, or Geländewagen, that was originally designed 26 years ago for the German military. Instead, the GL is a totally new class for Mercedes-Benz. It's the result of a careful market study that determined the company was losing former ML-Class customers to larger seven-passenger SUVs from other manufacturers. Being a larger vehicle, it’s challenging to escape the box look, and the front and rear ends showcase a nicer design than the sides. All that space on the outside translates to lots of room inside the very well-designed luxurious cabin, which has a total of eight drink holders. Third row seats conveniently operate with electric buttons. For safety reasons, only the passenger side second row seat flips forward for rear access. A deep foot well and a rear glass roof are prescribed to alleviate claustrophobia for that third row. Up front there are similarities with the ML and R classes, but the GL differentiates itself with a stitched leather dash that ads a warm touch. Audiophiles will not be disappointed with the Harman/Kardon LOGIC 7 multi-channel audio system that includes an eleven-channel DSP amplifier and twelve speakers. 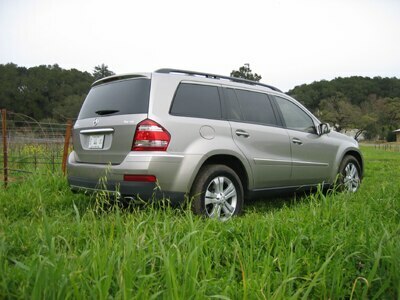 To boot there is also MP3 capability, Sirius satellite radio, separate front and rear audio controls and optional independent dual video screens to keep the kids occupied on that summer road trip to Yosemite. Standard eighteen-inch wheels are better for fuel economy, but some may opt for the nineteen- or twenty-inch rims for a bolder statement. 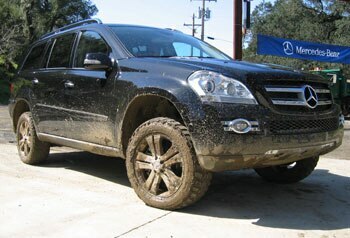 All GLs come with 4Matic all-wheel drive and with a V8 engine that makes 355 horsepower and 339 pounds-feet of torque. 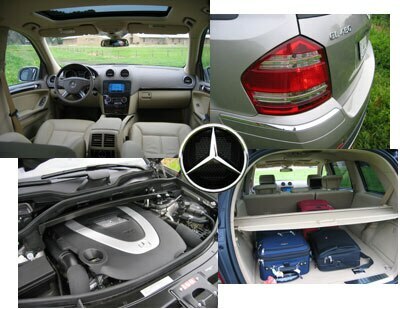 The engineers have packed in a full load of the safety features Mercedes-Benz has become legendary for. First of all, the car features a unit body frame constructed from HSLA steel that keeps the weight down. Second, there are eight air bags and all the safety acronyms one has come to expect, like ESP, ETS, BAS and EBP. A rear view camera and electronic park assist prevent you from backing over the lawn mower, and optional Distronic Plus keeps the GL at a safe distance from other cars when at highway speeds or in stop-and-go traffic. With its current estimated based price in the mid-50s, we think the GL-Class will be a success even when loaded with pricey options. With its optional low range, center and rear differential locks and three rows of comfortable seating in Mercedes-Benz luxury, why wouldn’t it be? Warranty/Service: Four-year/50,000-mile new vehicle warranty. 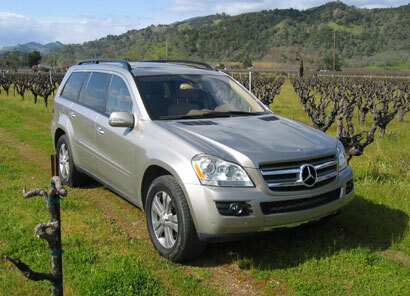 Available GL450 4Matic model with adjustable suspension.